William Hill have launched Bet Behind on Live Blackjack at their Evolution hosted Live casino. This is exclusively available on the William Hill dedicated tables, but I’m sure that it will be rolled out across the rest of the Evolution Casinos in the next few months. This now puts the Evolution Live Casino software on a level playing field with Visionary iGaming who are the only other software developer to provide all three Blackjack Side Bets, Perfect Pairs, 21 + 3 and Bet Behind. Bet Behind can be played if you’re just watching play at the table, perhaps because you can’t get a seat, or when you’re playing and fancy placing a bet on another players hand. The Bet limits are generally the same as the hand limits, the only difference is that you have no influence over the play of the hand. To help you to choose which player to bet on, Evolution have added a star icon that identifies the “hot players” at the table. The number in the star represents the consecutive number of hands the player has won.This gets reset to Zero when the dealer wins a hand. There are other configuration options available for Bet Behind that you can configure before you start playing. If the player doubles down, you can double down with him or not. If the player splits, you can split with him or play just the left hand. The main player also has the option to disable other players using Bet Behind on his position. I like this option, because it can be quite intimidating when other players are betting on your hand as it can change how you would normally act on your hand. So if you don’t like it, switch if off!! 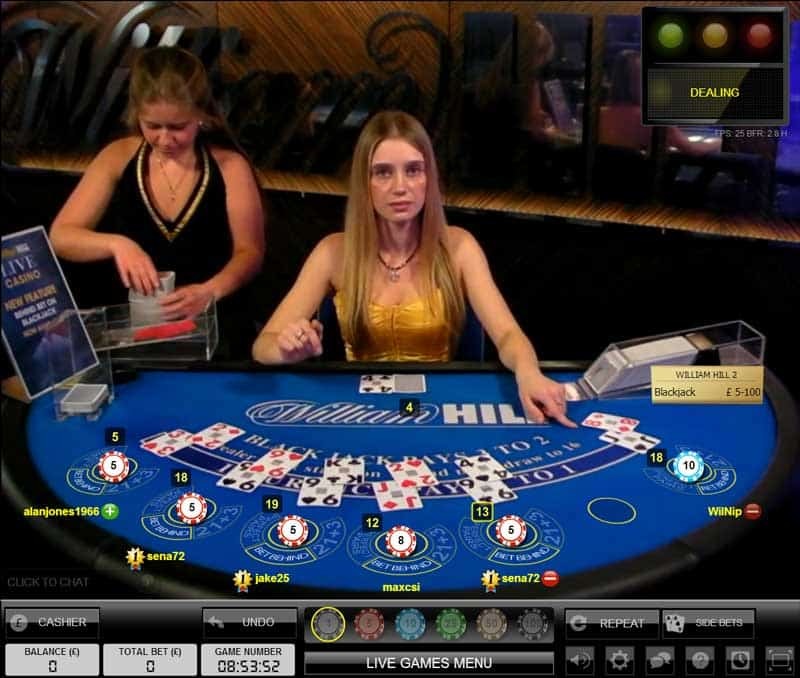 Go to the William Hill live casino to see bet behind in action.